Everyone knows puffins. Who could forget their comical behavior — with an appearance to match? 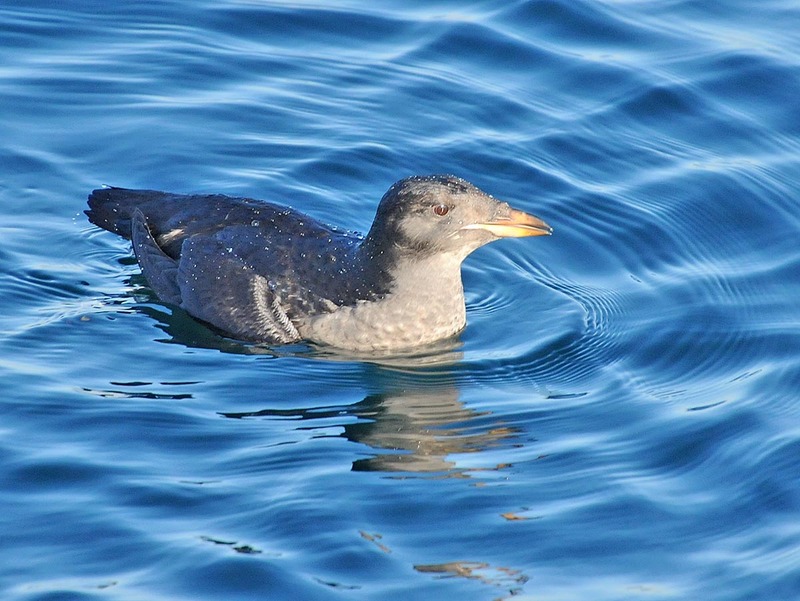 But you may not know about the Rhinoceros Auklet, a close relative to puffins, found in the Pacific Ocean. Its gray plumage is duller than that of puffins, but during the breeding season it sports a small spike on its bill — hence the name — and wispy white feathers on its head. While these birds may not grace the cover of promotional brochures, scientists find them valuable birds to study. 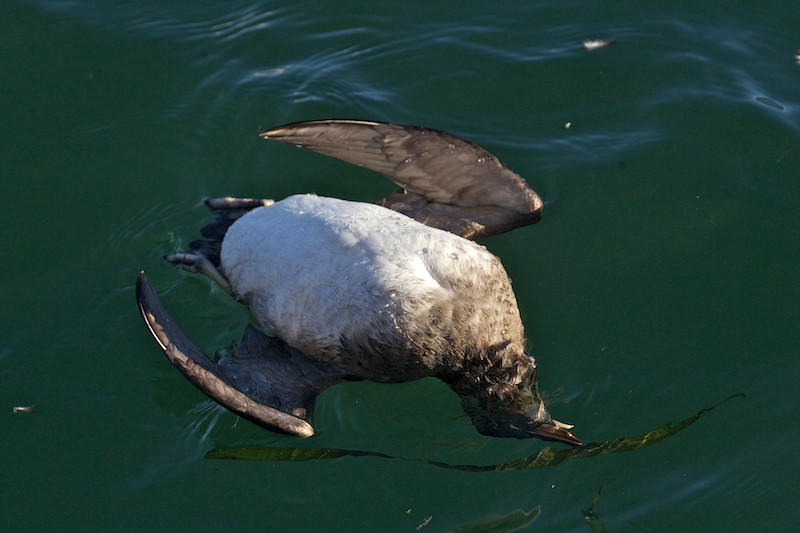 Seabird populations are declining in the Salish Sea, a stretch of salt water between Washington and British Columbia. It's important habitat for birds and other animals, from herring and salmon to sharks and orcas. 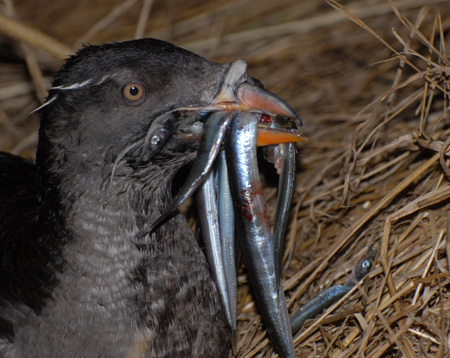 Because Rhinoceros Auklets are dedicated fish-eaters that both breed and winter in this area (many spend only the winter or migrate through), scientists have identified them as a good indicator of the overall health of the ecosystem. 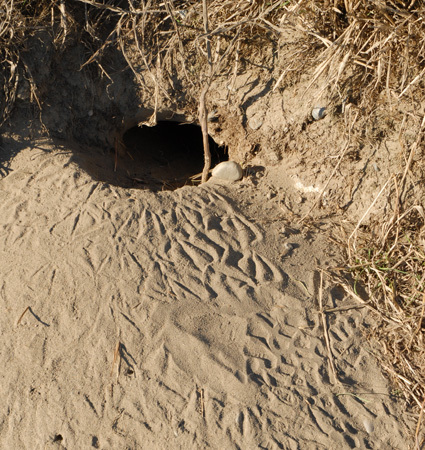 Rhinoceros Auklets nest in burrows, raising a single chick in a narrow tunnel that's up to fifteen feet deep. Adults may spend the entire day at sea foraging for small fish, such as sandlance and herring. To avoid predators, adults return to their burrow only at night, under the cover of darkness, to feed the chick. Both adults bring beakfuls of fish, usually around five fish per adult. Scientists are monitoring the type, number, and food value of the fish the adults provide. The 364-acre Protection Island is federally protected and closed to the public, because the ground is packed with the nests of tens of thousands of gulls and cormorants. 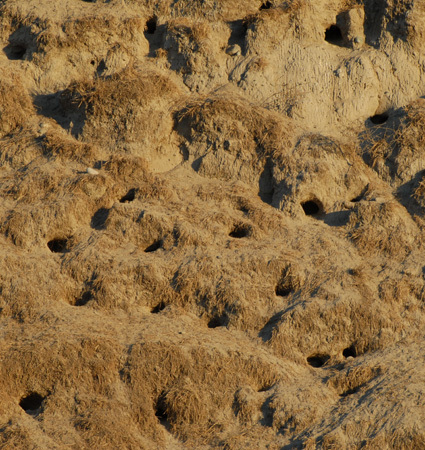 The high, sandy bluffs are also pock-marked with more than 54,000 burrows. So how do scientists monitor a species that returns to their underground nests at night? A long, snaking, infrared camera. 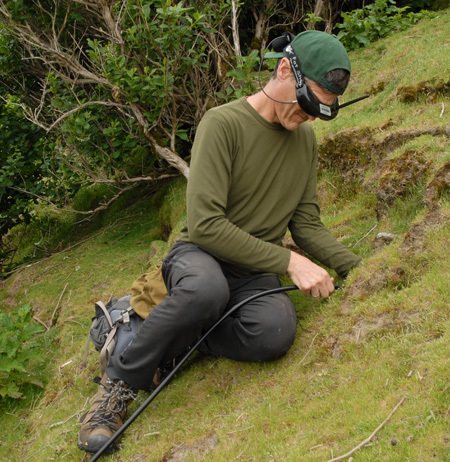 Using this camera and accompanying headset during the day, scientists like Scott Pearson at the Washington Department of Fish and Wildlife were able to assess that two-thirds of burrows were occupied by auklets. This knowledge is important for estimating the number of breeding birds on the island. Check out this video to see what the researcher sees in his headset, as he snakes the camera down a burrow. See how quickly you can spot the auklet at the end! The Rhinoceros Auklet population on Protection Island is substantial, but still it faces significant challenges. Black-tailed deer are overgrazing the island, trampling the birds’ burrows and subjecting them to erosion. And more and more, increasing numbers of Bald Eagles are making meals of the auklets. Thankfully, the population is monitored by talented scientists who use some very powerful tools.